When Preston Edmonson isn’t riding his horse, Annie, he’s smiling, enjoying his friends’ company and listening to music. He is very trusting and never holds a grudge, his mom, Teri Edmonson, proclaims proudly. The happy, friendly 20-year-old has grown a lot over the years, and he has done much of his growing at the Monroe Carell Jr. Children’s Hospital at Vanderbilt. 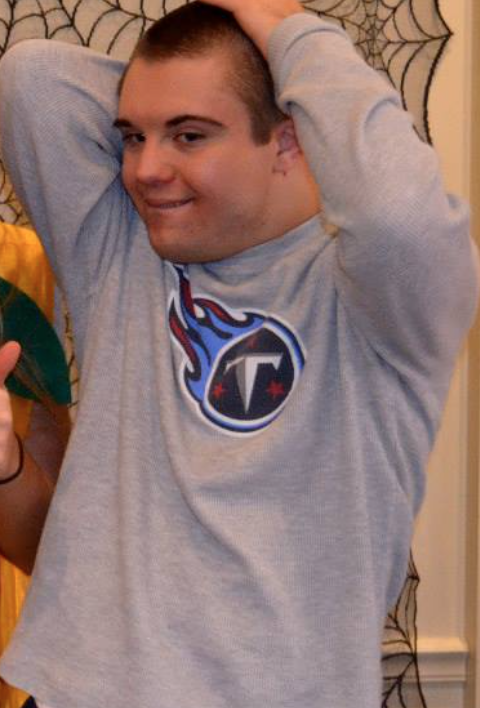 At a day old, Preston was diagnosed at Vanderbilt with Hirschsprung’s Disease, or bowel obstruction, and a couple days later with Down syndrome. Preston had to have emergency surgery to fix the blockage of his intestine. His family members had a lot to process in just a few days of his life as went they went through various emotions including bewilderment. “Then, I wanted to learn as much as I could,” said Edmonson, who is also chair-elect of the Family Advisory Council at Children’s Hospital. She devoured the information she received from the hospital’s Genetics division. Children’s Hospital has become like home for Preston, a resident of Thompson’s Station, Tenn. In 2011, Preston graduated from Independence High, and he is now in their Transition Program, learning employment skills. “He loves going to ‘work’ through his school system,” his mom said. Meanwhile, Edmonson works as an advocate for families as part of the advisory council and director of Development for the Down Syndrome Association of Middle Tennessee.